Welcome to the Kino Lorber Oscar Tribute DVD and Blu-Ray Giveaway! Elmer Gantry and Metropolis among other classic titles! 2) Successfully complete a qualifying entry task during the specified contest week within the overall contest period. 3) Winner(s) will be chosen at random at the end of each specified contest week within the overall contest period and announced on Twitter the following day. 2) Successfully complete a qualifying entry task during the specified contest period within the overall contest period. 3) Two winners will be chosen at random at the end of the contest period and announced on Facebook and the Blog the following day. 4) Two Prizes will be given away during the contest period, for a total giveaway of two prizes within four weeks. PLEASE NOTE for all prizing: Sorry, but only Continental United States are eligible (excluding Alaska, Hawaii, and the territory of Puerto Rico). Can't wait to win? 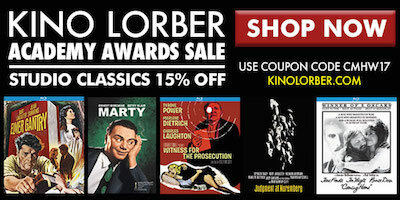 Visit the Kino Lorber website for some great titles and great deals. But that's not all... Use Coupon Code CMHW17 to receive 15% off titles purchased via the Kino Lorber website (valid through February 28, 2017)! 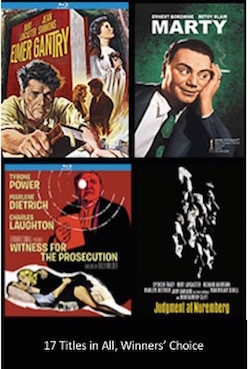 For more information about these and other titles, you can visit Kino Lorber on their website, on Twitter @KinoLorber or on Facebook. Winners will have their choice of Prizes from the list below, one Prize per winner. Winners will have their choice of DVD or Blu-Ray format (when available). Visit our blog post to see the movie descriptions here. TO WIN: Winner(s) will be chosen at random at the end of each specified contest week within the overall contest period. Winner(s) will be announced on Twitter the day after each specified contest week ends. PRIZING: Two Prizes will be given away each specified contest week during the contest period, for a total giveaway of ten Prizes within four weeks. Winners will have the choice of select Kino Lorber Classic Titles, either on DVD or Blu-Ray format, (as available) for their Prize. TO WIN: One winner will be chosen at random at the end of each designated contest period within the overall contest period and announced on Facebook and the Blog the following day. PRIZING: Two prizes will be given away during the contest period, for a total giveaway of two prize within four weeks. Winners will have the choice of select Kino Lorber Classic Titles, either on DVD or Blu-Ray format, (as available) for their Prize. * Limited to Continental United States (excluding Alaska, Hawaii, and the territory of Puerto Rico) only. * Only one prize per winner. * Giveaway starts Monday November 28, 2016 and ends on Saturday December 31, 2016 at midnight EST or when all prizes are exhausted (whichever comes first).